When I came Australia about 5 years ago, except the family i missed the food specially snacks, street food. Street food is available in Bangladesh usually nobody makes them at home. i wanted to make home away from home ALOO PURI (afternoon snacks). I was so excited to make it. Hope you will feel same like me to make Aloo Puri. Aloo Puri is basically potato stuffed flat deep fried bread. 2. Add the water slowly and mix as you pour. 3. Knead the dough. The dough should be soft. 4. Cover the dough and let it sit for 15-20 minutes. 2. Mix with onion, chilli, coriander and salt together. 1. Divide the dough and potato filling into 8 equal sizes. 2. Roll the dough into 3 inch diameter circles and place the filling ball in the middle. Seal by pulling the edges of rolled dough together to make a ball. 3. In this way make all 8 balls. 4. Let them sit for 5 minutes before rolling them. 5. Heat the frying pan (thick base preferred) on medium heat and pour the oil. 6. Roll the balls. It will be easier if you roll the ball in dry flour. 7. Carefully press the ball on the seal side and keep it on the topside when rolling and make it 3.5’’ diameter. 8. Check the oil to put a little piece of dough in the oil if it sizzles and comes up slowly .It means he oil is ready. 9. Place the puri in the oil and fry it until golden brown on both sides. Serve the puris with a sprinkle of black salt (bit lobon). 2. Mash the potatoes thoroughly. Excellent. 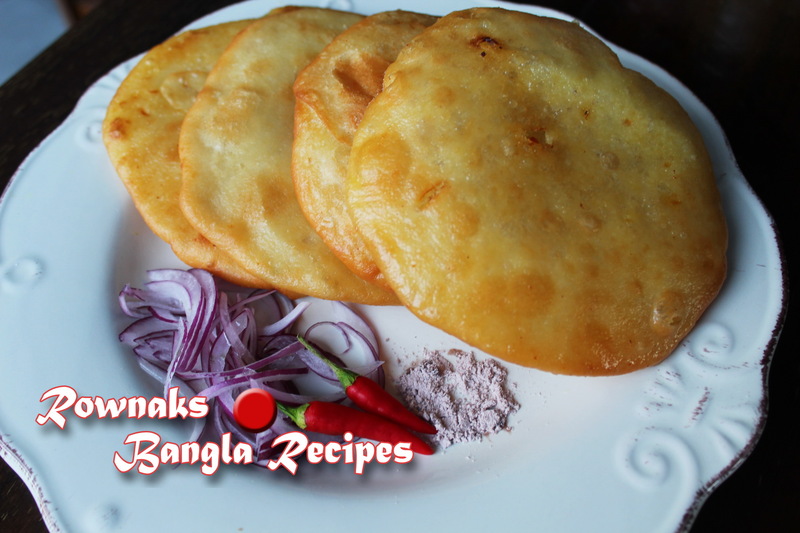 I just liked your blog, all the authentic Bangladeshi. Could you please post for Daal Puri? This is so tasty. Thanks for you comment. I will post Dal puri soon..